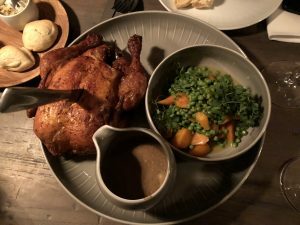 Berlin and Munich may both be major cities in Germany, but they are very different from one another, both in the language and culture, similar to the differences between the deep south of the US vs. the cities of the east or west coast. I got to explore both on bicycle. Munich is Bavaria’s (Bayern’s) capital, with a population of just under 1.4 million. 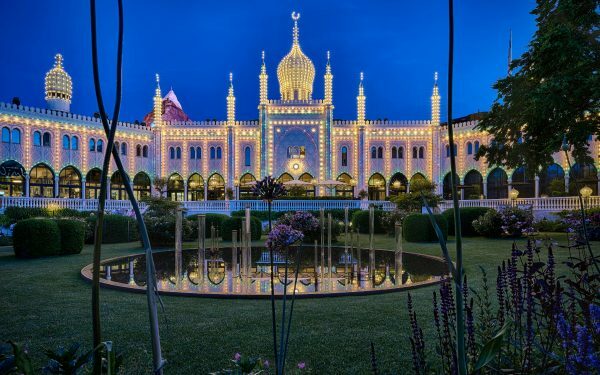 It’s a city known for its annual Oktoberfest celebration, beer halls, centuries-old buildings and numerous museums. 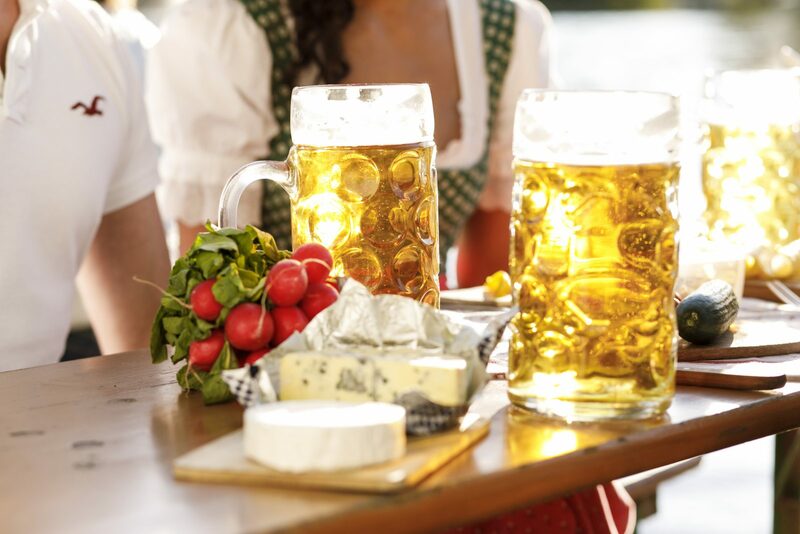 Bavaria is located in the southeast of Germany, and Bavarians speak a derivative of Old Bajuvarian called “Baierisch” that has a darker pronunciation of certain vowels. Bavaria is 90% Catholic, whereas Northern Germans tend to be Protestant. It’s commonplace to see women wearing dirndls and men in lederhosen. Berlin, is Germany’s capital, and has over 2 million more residents than Munich. 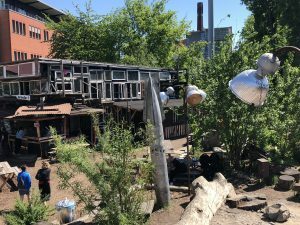 Berlin is marked by reminders of its turbulent 20th century history with the Holocaust memorial and the remains of the Berlin wall serving as a backdrop to the city’s art and club scenes. Conveniently, the ICE High Speed Sprinter train connects the two cities in under 4 hours. Operated by Deutsche Bahn and available through Rail Europe, the route opened late last year after a 25-year build. Traveling at an average speed of 185 mph, the new line cuts the duration of the trek by more than a third. 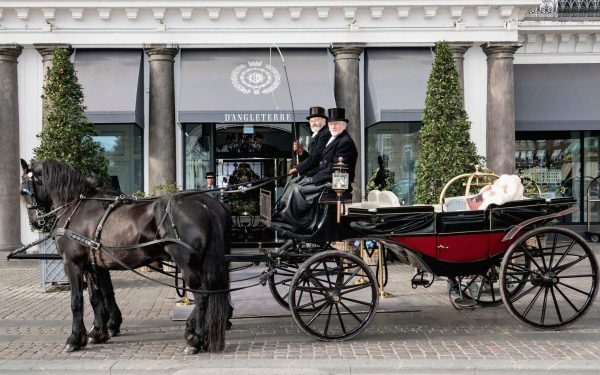 No airport security hassles, comfortable seats, no baggage fees, and no internet fees…there is no better way to connect between these two poles of Germany. 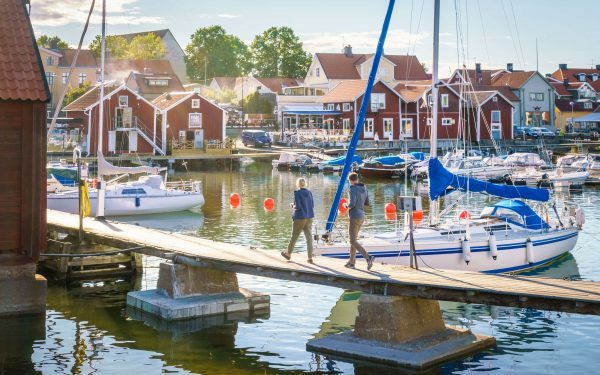 What the two cities do have in common is the residents’ passion and love for their city, delicious food and drink, and convenient ways to get around. 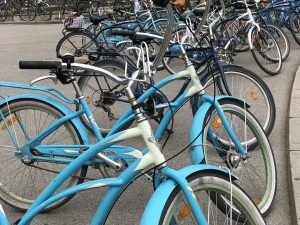 Walking, subway and light rail systems are all easy, but with nice weather, the bikes come out, and are a recommended way to see both cities, both of which have extensive bike trails. 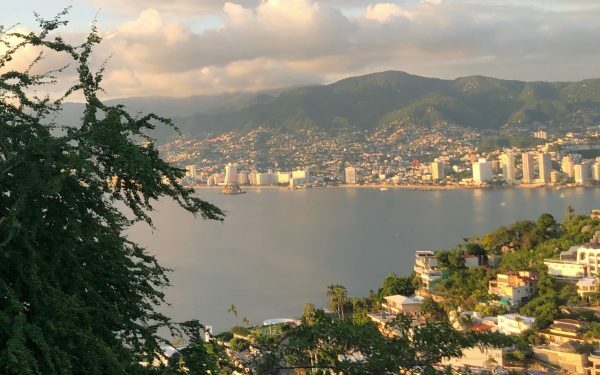 The benefits are obvious, you can cover a lot of ground, see everything up-close and get a little exercise and fresh air while enjoying the sites. 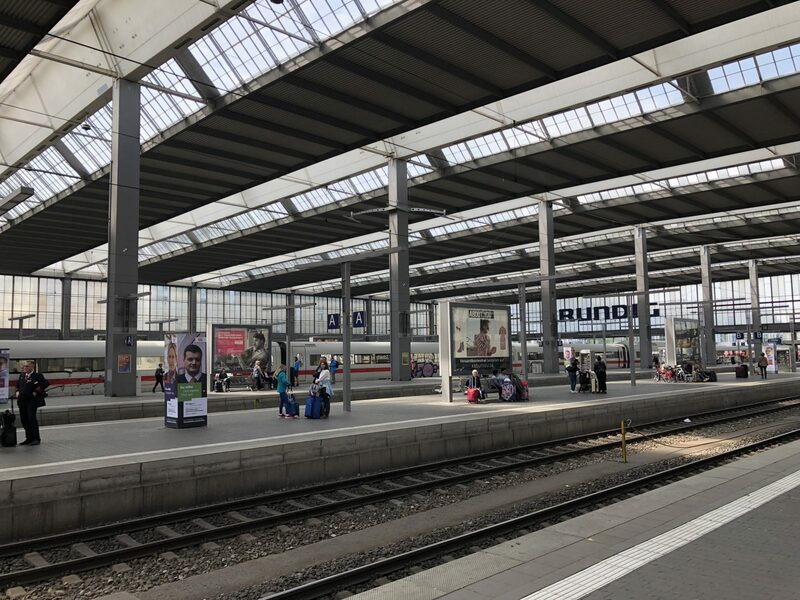 We started our bike ride in Munich with Radius Tours at the Hauptbahnhof (main railway station), just off the Königsplatz (King’s square) which is modeled after the Acropolis in Athens. The massive square is home to Munich’s Kunstareal, the city’s gallery, museums, and its college quarter. Here you can find the Glyptothek, the museum of classical art, and not too far away, the old, the new and the modern Pinakothek. After that, we pedaled to the Brandhorst Museum, which is a modern art museum that opened in 2009, and after that, to the Wittelsbach Fountain, the most monumental fountain in Munich, which was created by the German sculptor Adolf von Hildebrand at the end of the nineteenth century to commemorate the construction of Munich’s water supply system. 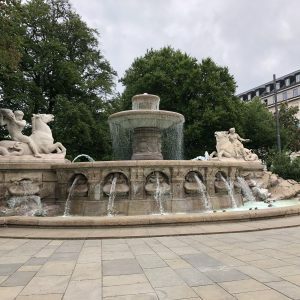 Parks and gardens are a must when the weather turns warm in Germany, so we headed over to the Hofgarten or Royal Garden and the English Garden, a 900-acre expanse larger than Central Park. 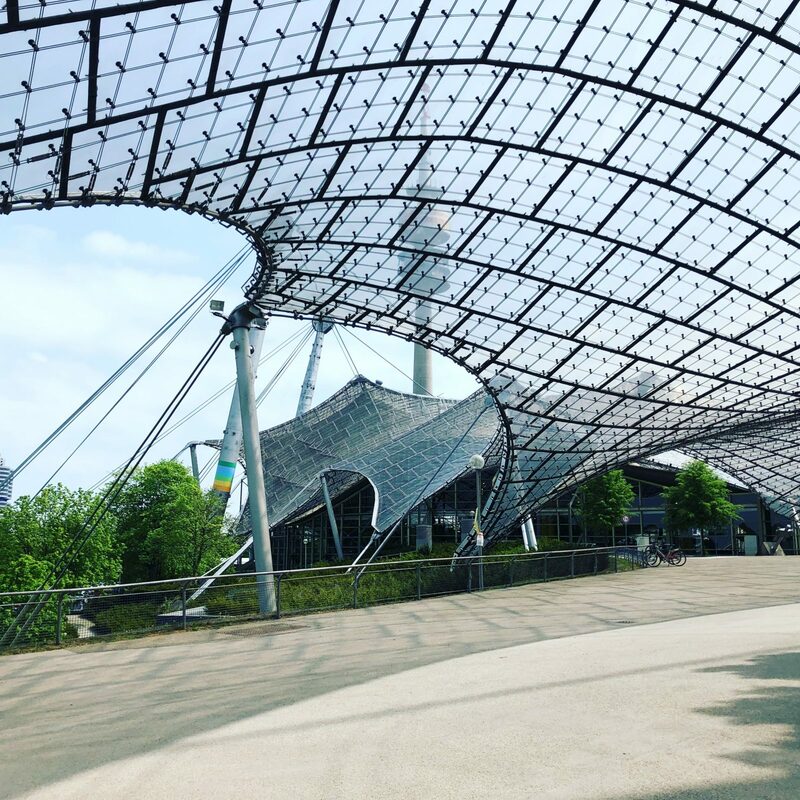 This is also the site of the Olympiapark, built for the 1972 Olympics, where scaling the roof and zip lining is an adventure option we enjoyed. 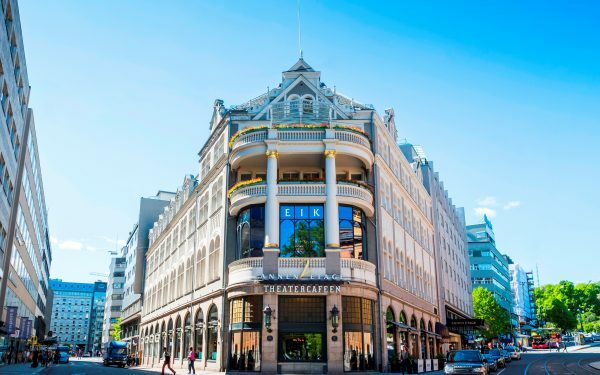 Here, a stop at the historic landmark Chinese tower beer garden and indulging in Wienerschnitzel, giant pretzels, and a Hofbrahaus beer is a must. With seats for over 7000 people, this place is jam-packed during Oktoberfest. At the far end of the garden is a very cool river surf spot, Eisbach at Haus der Kunst. It’s a sight to see surfers in wet suits taking turns riding a continuous ice-cold wave rolling through an artificial channel in the middle of the city. 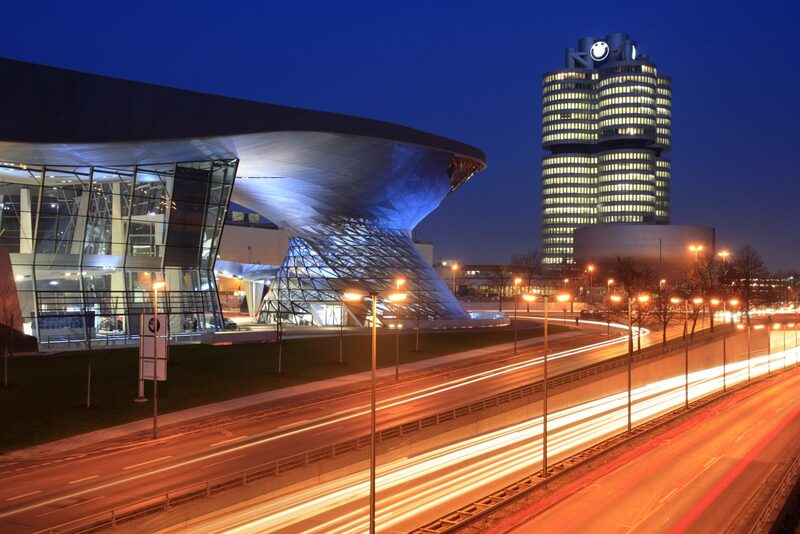 If you get tired of riding a bike, Munich is the home of BMW, with the BMW Welt museum. Here you can make arrangements to test drive a car for an hour, a day or a few days. I had the luxury of driving an i8, and cruising the Autobahn with speeds of up to 130km (okay, 80mph). In the evening, we ditched our bikes and made for a trail of food and drink, or should I say drink and food. 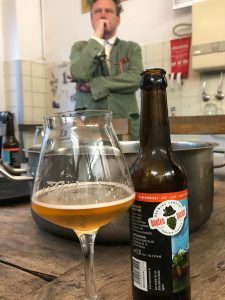 Craft breweries are as popular in Munich as they are in the United States. A tour of a small brewery and beer tasting hosted by a true character of an owner at Hopfenhaecker was followed by a BBQ/Smoked Snack at Meisterstueck Haidhausen, more beer and snacks of roasted meats and sausages at the larger and better known Paulaner am Nockherberg brewery, and finally, a little bar hopping in the Glockenbach district, including whisky cocktails at Zum Wolf. Late April and early May is white asparagus season, so many a meal is served with this delectable vegetable. My favorite was the white asparagus carpaccio with shredded parmesan, and thinly sliced strawberries, cooked with citrus. 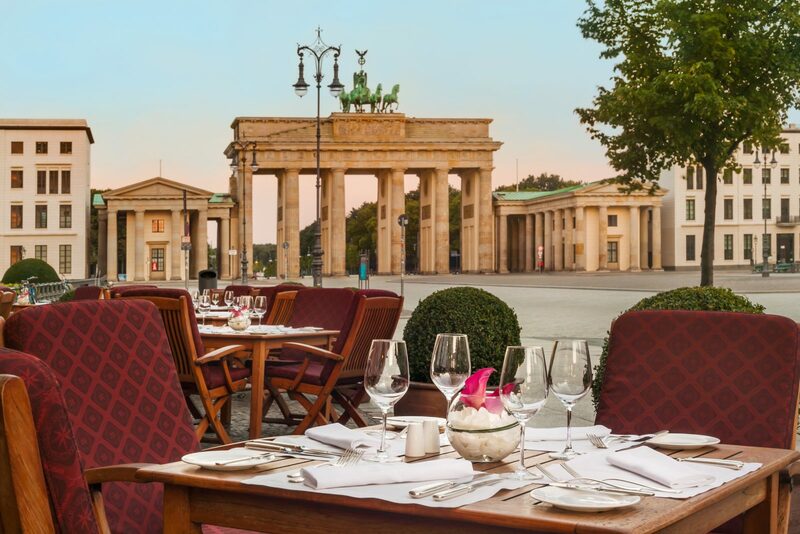 After the smooth and easy train ride on the ICE, the journey continued in Berlin with a stay at the centrally located 5-Star landmark hotel Adlon Kempinski, next to the Brandenburg gate, the city’s symbol of reunification. 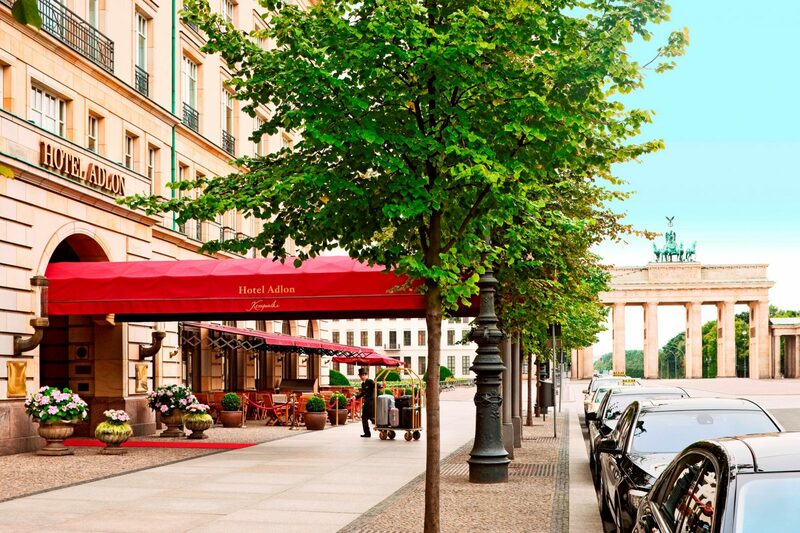 This unique location, legendary history, opulent furnishings and décor as well as impeccable service make the Hotel Adlon Kempinski ideal for business and leisure travelers alike. 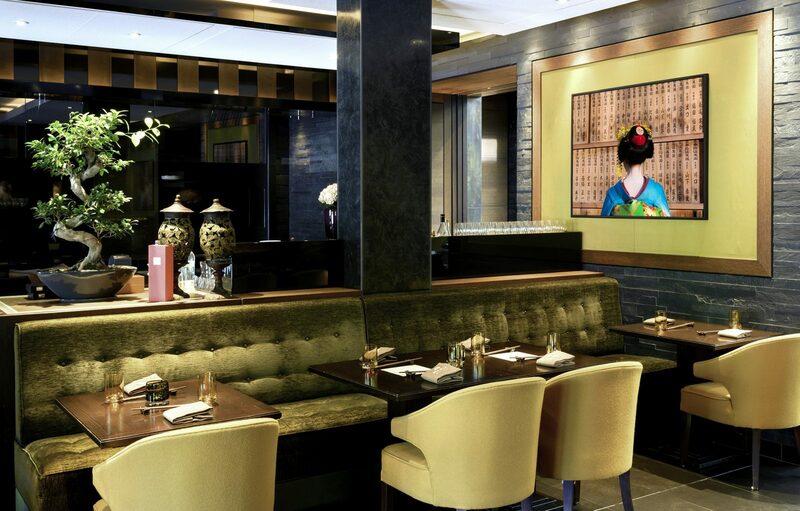 The hotel has 307 luxurious guest rooms, 78 exquisite suites, 3 restaurants, a world class spa and wellness area. 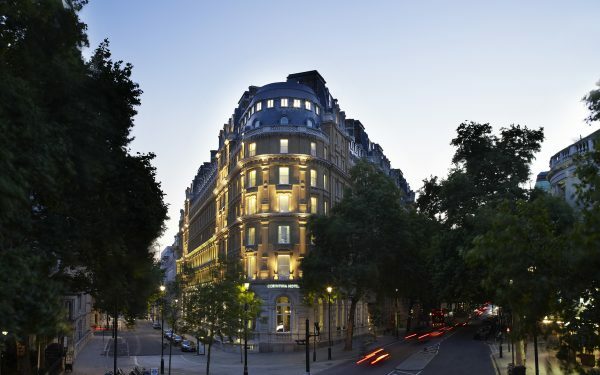 The hotel is legendary for hosting dignitaries like the Queen of England, but most notably for being the hotel where Michael Jackson hung his infant son Prince out the window. Head out the back entrance, and you’re next to the Holocaust Memorial. Walking through it brings the severity of the time to our consciousness. 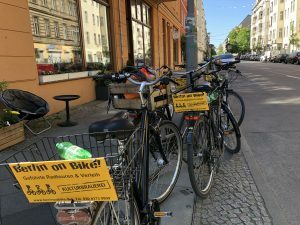 We started out our Berlin on bike tour at, where else? the Kulturbrauerei, which was once the largest brewery in the world. On this glorious day, we headed over to Mauerpark, a flea market with weekly impromptu festivals. 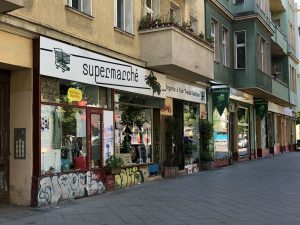 It is a little-known fact that there was some distance between the East and West Berlin walls and this market is set in the area which used to separate these structures. Cycling to the Berlin Wall Memorial, we avoided a lot of the sidewalk crowds, and once there, we experienced the museum, the TV tower, the red town hall and Alexanderplatz. We headed off to a place called Holzmarkt Urban Village, sitting on the river’s edge where an underground group of people and artists have become businessmen to support their unique lifestyle. We visited a treehouse where two old friends built a residence and garden in the unclaimed area between East and West after the wall fell. Berlin has become something of a hub for eco-conscious fashion and food, so we visited a neighborhood that sells fashion exclusively made of recycled/upcycled material and has a trash free supermarket, followed by a lunch at Café Botanico where we served delicious homemade pastas flavored with herbs from the on-sight garden. 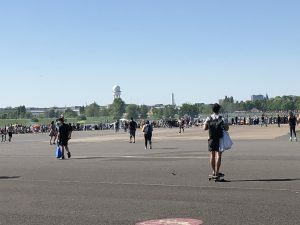 To finish our ride, we pedaled through Brander Tempelhof airfield, site of the city’s decommissioned airport, which is one of the most expansive outdoor spaces in Berlin with almost 1000 acres of open space. Thousands of people were using the area for picnicking. 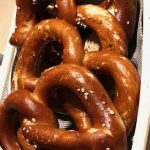 Contemporary food and nightlife tours from http://berlinagenten.com/ are unique and special. Our dinner tour started at the Adlon’s “Sra Bua by Tim Raue”, with a tuna appetizer in the kitchen, followed by culinary stops at Elements for traditional Italian starters in a rustic and trendy location and a main course at TISK, a combination of modern and traditional German cuisine paired with classic Berlin style bar for the best roasted chicken I’ve ever had and dessert at Coda, Berlin’s first dessert bar that services creative offerings paired with interesting cocktails.